Standard Size Vase With Wide Opening. Attach To Any Window Or Mirror. The easiest way to enjoy fresh flowers in almost any location. When space is limited, this flexible vase will display flowers or other plants right on a window, mirror or other flat, smooth surface. Even when you have ample space available, it can give a great look when hung in any location, and it can free up counter or shelf space by elevating your arrangement. You also gain the benefit of expensive arrangements being held out of the reach of children and pets. This vase is a pretty standard size, so it will hold most store bought arrangements with ease. You can even use it to take fresh clippings from your garden in order to enjoy them inside your home. Two powerful suction cups keep it in place without trouble, so you will be able to display fragrant roses on a bathroom mirror, or large sunflowers in a kitchen window. Because it is totally flat when empty and not in use, it also works great for use while traveling in a boat or RV. This one is pretty average in size when compared to traditional vases you are familiar with. If you would prefer a smaller one, then check out these other versions: Single Stem, Single Bulb, and Mini Oval. For one that is larger, check out the Three Blossom version. 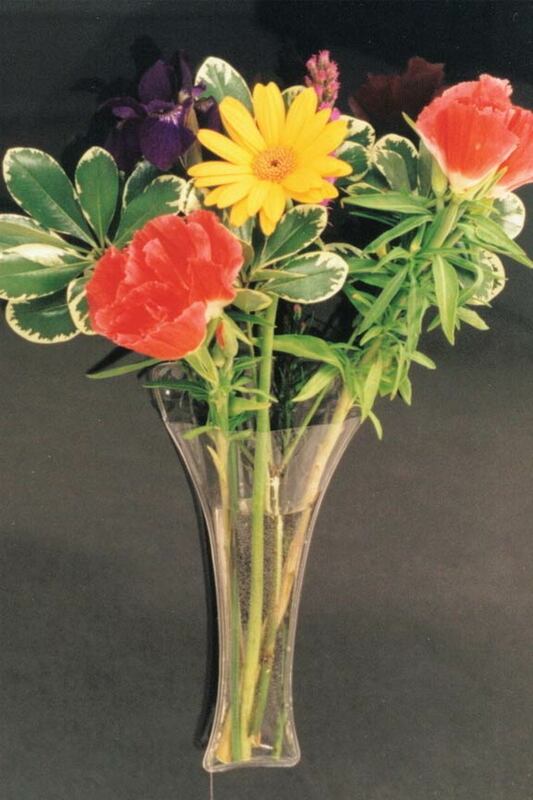 Although it looks like glass when filled with flowers and water, this product is actually made of clear vinyl. This familar plastic material is quite durable, and basically unbreakable. It is also lightweight, easy to clean and long lasting, so it will be a useful product that will last through many uses. It is made by taking to vase-shaped pieces, and then bonding them together at the edges. Two powerful suction cups are permanently attached to the rear side, and are used to suspend the vase when you attach them to any smooth surface. When empty, the vase will lay completely flat, but as you add flowers and water, it will expand to fit the contents you add, and also to develop a more three dimensional look. Because the material is flexible, when you stick it to a wall, the back side will flatten to maintain stability, but the front side will bulge to look like a regular vase. If you would prefer a glass vase with suction cup, we also carry one of those. It is significantly smaller than the one featured here, but some people may prefer the material or styling. Thanks to the material that this one is made from, it takes up way less space when not in use, and you never run any risk of damage due to accidents. 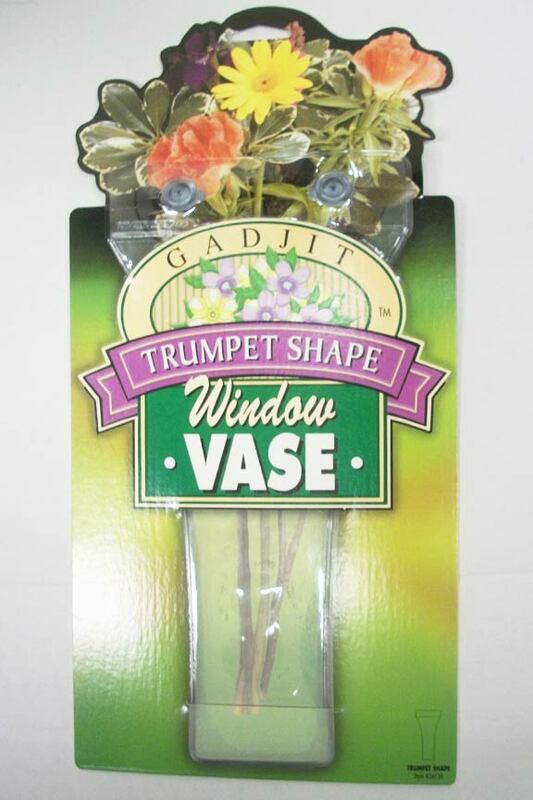 Anyone can use this Trumpet Shape Window Vase. It is incredibly simple to install once you find a good place, so it is one of the easiest ways to enjoy fresh blooms when space is limited. Textured walls and other uneven surfaces will cause trouble because the suction cup will be unable to maintain a strong bond. Surfaces made of glass, metal and other smooth materials will be your best bet when looking for a place to hang it. Once you have decided on an ideal location, it is important to clean it thoroughly, no matter how dirty it looks. After you get it clean, you will also want to dry it thoroughly prior to mounting the vase. If the surface is dirty, you could have trouble getting the vase to stick, and if it is too wet, you could have a problem with sliding that would be avoided once dry. After the surface is ready, simply add your desired flowers to the vase, and then fill about half way with water. Once the arrangement is all set, simply stick the suction cups in the location you have prepared, and apply firm direct pressure to lock them in place. If you have trouble with the vase staying in place, try treating the suction cups with a little bit of moisture to create a stronger bond. Use with fresh cut flowers and water, fake ones made of silk, real ones that have been dried, or even live plants with dirt. Surprise your significant other with a bouquet of flowers right when they least expect it. You can easily load up an arrangement, and then stick this vase in a spot where you know it will get noticed. Don't settle for standard decor, or run of the mill gifts. This versatile vase will liven up a dull workplace, add natural fragrance to any room, or insert a splash of color in an otherwise boring location in your home or office. Place flowers on a mirror in your bedroom, or display fresh blossoms on your living room window. The flowers will look great thanks to the shape of the vase, and they will stay fresh longer thanks to the water you will add. Due to the affordable price tag, you can gift flowers in this vase and they will have something they can keep to use over and over again. Greet visitors with blooms on the front door, or pamper guests with fresh clippings at their bed side. The possibilities for enjoyment are nearly endless with this useful decor item. Order Yours Today! Vase Shape Wide cylinder with large, "trumpet" shape opening at the top. Where to Use Stick to any clean, dry surface that is also smooth. Ideal for windows and mirrors, but works well on other glass and metal surfaces, polished wood, finished stone and more. Cleaning Rinse with warm water, or use mild detergent when necessary. Allow to dry completely prior to storage. Trumpet Shape Window Vase - The easiest way to enjoy fresh, fragrant flowers in almost any location. Simply stick to any smooth surface like glass or metal for a splash of color in any room. Order Yours Today! Scented Oil For Use With Misting Fountains, Oil Warmers and More. A Decorative Humidifier, Colorful Lamp and Water Feature In One! Elevate and Rotate Projects. Save Time, Reduce Mess & Improve Your Results! A Compact Flower Vase That Attaches To Windows And Mirrors. Use Inside Or Out. The Look of Natural Stone For Less! Two Weathered Vessels Dump An Endless Stream Into The Hollowed Out Wood. A Powerful Waterfall Drops Down Into A Lighted Pool. Fiberglass Resin Looks Like Real Wood. The perfect blend for a fresh and fruity aroma. Give your home a lively scent, or use as the perfect fragrance for homemade products.